Vismaya Amusement Park is situated near Taliparamba in Kannur. The park run and developed by Malabar Tourism Development Co-Operative Limited. It is situated near to the famous Muthappan Temple in Parasinikaddavu. Read here more details. Vismaya Amusement Park is famous park at Kannur which was officially inaugurated in August 2008 and since it becomes one of the favorite tourists now. The Park is completely operated by the rain water reservoir spread all over the park and recycling also done here. There are also some waterfalls, trekking paths for adventurous traveler. Another thing around Kannur is the Amusement park which is most likely by every stage of people. Vismaya Amusement Park comes with more than 40 rides of dry and water based. The park feature with wide variety of attractions including some rides, water rides, a musical fountain and laser shows which is reality shows. Vismaya Amusement Park has a full-fledged riddance floor with a twist electrically controlled rain showers. Vismaya Amusement Park has an fascinating view which is undertaken by Malabar Tourism and got with many rides and people prefer to enjoy the holidays here. It uses solar heated water for all its pools during winter. It featured with conference facilities for up to 1000 persons and features 5 restaurants with a total seating capacity of 1150.it also comes with locker system First aid and Paging system also available. Vismaya Amusement Park is one of the only 2 amusement parks in India to implement OHSAS 18001:2007 safety standards all attractions and components are maintained accordingly to be at great standards provided to be a safety measure. Almost every ride is maintained with more safety and water processes are recycled every now and then. The park has a water quality control laboratory to monitor quality levels used for different purposes. The Vismaya Amusement Park comes with more plantations of about 2000 to keep it an Eco-friendly and also the park comes with the Rain water Harvesting system also maintained with special care with purified with recycling and serves a drinking water and also uses solar energy extensively to heat waters in pools and kitchens. The Vismaya Amusement Park Holidays also have some more attractions like Aqua Trail, Multi water play system, Rocky falls, Family Pool, Uphill Water ride, Wave pool, Multilane, ,Sky train, striking car, Tide pool, tornado, twister are the most attraction part of Vismaya Amusement Park and people will surely enjoy these rides an all these are handled with good care .The Amusement Park also provided with the exquisite restaurant with both vegetarian and non-vegetarian menu, Food courts, ice cream parlor and Gift shops are also available inside the Vismaya Amusement Park . Vismaya Amusement Park Is getting into the process of setting worldwide and it is going to be set in more states very shortly. Would you like to visit best Water Park in Kerala? 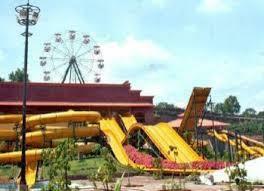 Dream World Water Park is very famous water park in Kerala which is located at Thrissur. Do you want to know further details? Read here attraction spots, facilities, address of dream World Water Park. Do you want to visit best Amusement Park at Palakkad? Fantasy Amusement Park is one of the top amusement park in Kerala. Do you want to know more details about Fantasy Amusement Park? Read here about details, attraction spots, facilities of Fantasy Amusement Park. Sadhoo Merry Kingdom is located at Kannur district. It was established in the year 2007 and it is favorite place for many tourists. There are several rides that entertains people of all ages. There are water rides as well as dry rides available. Read here about more details. Silver Storm Amusement Park is located in Kerala which is also known as the Kashmir of South which is very much famous and most fascinating and is captured from our eyes. The climate plays the most important role in Kerala. Read here more details.